Whether you attend crops weekly or just want to be more organized at home, Creating Keepsakes totes are a great investment. Use one of these totes and you will never have to hunt for your supplies again. Creating Keepsakes founder Lisa Bearnson, was the editor-in-chief of Word Perfect Magazine and an avid scrapbooker in the mid-1990's. She decided to turn her editing experience and her love of scrapbooking into a new career and in 1996 founded Creating Keepsakes magazine. At the time there was very little inspiration available for scrapbookers so the magazine quickly took off. As the industry grew, the company branched out into other scrapbook areas such as conventions and supplies. Bearnson has since sold the company to Creative Crafts Group, who owns several sewing and paper craft magazines. The tote is the perfect size for taking to crops or scrapbook parties. Your hostess will be green with envy! If you have never been to a crop, you are in for a treat. A crop is an event where you and your friends get together to scrapbook. The event is called a crop because you "crop" your photos. Crops are held at churches, homes and sometimes even local scrapbook stores. In order to make the most of your time, use your Creating Keepsakes tote to carry your supplies. Make a list of the layouts you plan to complete during the crop and take the photos, paper, and embellishments from home. 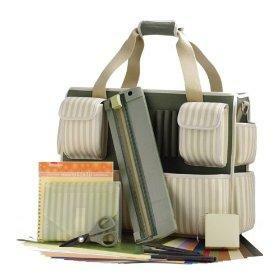 Put all of the items for each layout in a separate scrapbook paper tote and slip them inside your bag. Supplies such as adhesive, scissors, and paper trimmer easily fit in the outside pockets. In much the same way you would prepare for a crop, take your tote to conventions or classes. This will reduce the likelihood of purchasing duplicate items and also provide a place to store your newly purchased paper and embellishments without them getting damaged. Dedicated scrapbooking space may not be available at your home, so the tote is a convenient way to keep all of your supplies in one place. When you are ready to scrap, simply lay your items out on the dining room table and get inspired. Once your layouts are complete, load your supplies back into the tote and hang it up until your next scrapbooking session. This method also prevents you from buying too much stuff! Whether you use your tote daily, weekly, or whenever the mood strikes, keep it looking brand new by taking care to keep ink pads, markers and glue tightly capped when not in use. If you do happen to get stains on your tote, a general household cleaner like 409 should remove any spots.